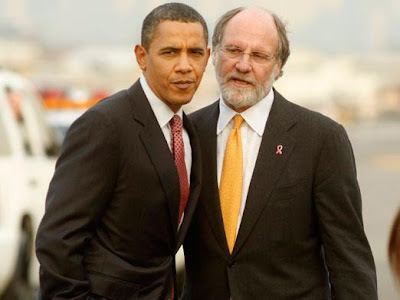 It's safe to say these two are joined at the hip, although the way the media is reporting the downfall of Jon Corzine's MF Global, you wouldn't even know Corzine's a Democrat, let alone one of Obama's top campaign honchos. So it's worth noting this story from July. Corzine's name popped up on an attendance list for a controversial and secret White House sit-down with leaders of New York's financial sector late last month. He has also aggressively worked the phone lines and the cocktail-party circuit. And in the last few months, Corzine hosted a high-end fund-raiser at his Fifth Avenue home for Obama. He even secretly organized a meet-and-greet at the Four Seasons for key finance-industry execs and Obama's new chief of staff, former banker Bill Daley. Where are the good government types screaming from the rooftops about Obama's deep connections with this man facing, to put it mildly, a very uncertain future? Can you imagine if such a close pal and fundraiser for Bush was up to his neck in problems and whose company is under investigation after $700 million went missing? Where are those noble souls "occupying" media attention to demand a perp walk for Obama's good buddy? Naturally, Corzine's former stenographers at the Star Ledger are crestfallen over the downfall of the guy they shamelessly supported while he was buying a Senate seat and later the governorship. Laughably, in his support they trot out corrupt former Senator Bob Torricelli, who was forced from office back in 2002. Former U.S. Sen. Robert Torricelli, who was close with Corzine, said the former governor has had his share of troubles over the years. "Jon has suffered a series of very difficult professional blows, and I know professional difficulties affect him deeply and personally,’’ he said. "The wound of being fired from Goldman Sachs never healed." The defeat in politics, though, may have been easier for him to accept than the failure of MF Global, said Torricelli. Politics, he pointed out, was only an adopted avocation. "In some ways this is probably more difficult," said Torricelli. "It’s a heart-breaking situation." Actually, it seems more like a criminal situation, Bobby. You'd know all about that. Corzine: "Obama is our Washington guy." The symetry is now complete.